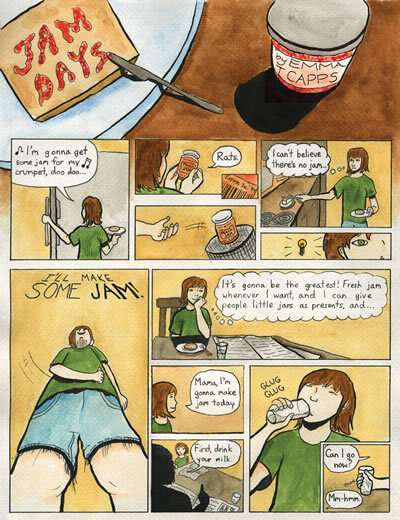 Let's take a look at a variety of diary and autobiographical minicomics. He Also Has Drills For Hands!, by Marguerite Dabaie. This is a self-curated collection of Dabaie's best daily strips over the span of a year, and the result is a minicomic that leaves the reader wanting more. These are drawn in a sketchbook and combine the intimacy and loose feel of such a drawing with a surprising level of detail and some attractive decorative features. In her Hookah Girl comics, Dabaie isn't necessarily known for her sense of humor (though there are funny moments), but her daily strip is far more likely to end with a punchline of some kind. The title of the strip refers to one of her childhood crushes--a character from a video game with drills for hands. Dabaie throws in bits and pieces from her childhood, creativity, daily life, her then-fiancee (and now husband) and a tale about inadvertently meeting John Cusack. In the selection of comics she published in this mini, it seems that she takes great pains to tell an entertaining story of some kind in her strips, rather than just focus on relating particular quotidian events. That said, Dabaie does reveal bits and pieces about her life through stories about her grandmother and things she sees on the streets of New York--it's just that every strip has the same slightly comic and exaggerated flavor, heightened by the charming immediacy & roughness of her line. Spinadoodles: The Second Year, by Sam Spina. This is the latest big batch of diary comics from Spina, a cartoonist who's clearly attempting the daunting task of getting better in public. In over a year and a half worth of daily strips (he never missed a day), Spina tries different art styles and moves a bit away from the obvious influence of James Kochalka. The overall experience of reading this was not as rewarding as reading the samplers from Marcej and Dubaie, two cartoonists who pared down their strips to a "best-of" selection. Spina chose to steam ahead with every last strip, no matter if they were half-assed, uninspired or repetitive. This mini is a document not only of his life, but also of his development as an artist. It wouldn't be quite truthful to omit strips done while he was dead tired from a long day at work, but the resulting reading experience was a bit of a slog at times. This is not to say that there weren't highlights; indeed, about 1 out of every 4 strips either landed a decent laugh, contained a personal revelation or had an interesting drawing. 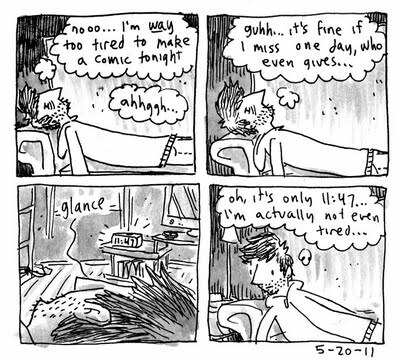 Given that there are 400 or so strips (with 4 crammed to a page), that's still a fairly solid showing. And some of the best strips (like the ones where he shows snippets of arguments with his girlfriend) are all the more effective because their tone is so unlike his other comics. The strips that work best are usually the ones that look the least like Kochalka's; that is, strips with less line weight (especially in the panels) that rely more on the basic figures rather than textures. One thing that surprised me was that after a certain point, the rhythm of the strip started to grab me. It wasn't so much that the individual entries became noticeably stronger over time, but rather the kind of observations Spina was making started to become appealing on their own. Spina portrays himself neither as a deep thinker or someone who's especially introspective, but the raw surface energy of his observations has a propulsive quality. Eventually, Spina's simple caricature of himself (big, angular nose and sharp chin), frequently childlike enthusiasm, and self-deprecatory charm leave more of an impression than any particular anecdote. Projects like this eventually tend to have diminishing returns (Spina himself complains about how much more productive he might be if he wasn't doing a daily strip in one entry) unless they become one's life's work, ala Ben Snakepit. I don't think this is true of Spina, so I imagine there will come a point where what he's getting out of drawing these strips is far exceeded by the amount of time and effort he puts into them. 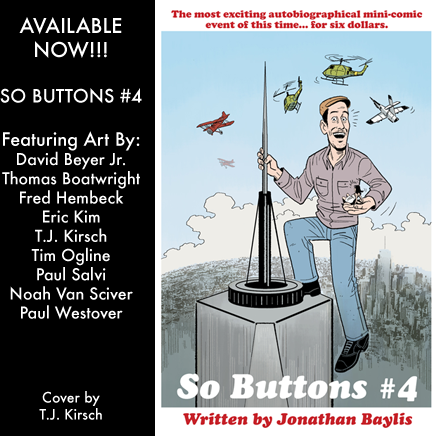 So Buttons #4, by Jonathan Baylis and various artists. Baylis has been writing autobio comics drawn by others for the past couple of years, but this issue of So Buttons represents his biggest leap forward in all respects. First off, the format and coloring of this mini are clean, attractive and reflect a lot of attention to detail. Second, the ordering of the stories was deliberate (as Baylis notes in his introduction) and far more effective than in past issues. There's a beautiful flow of styles as Baylis roughly moves in chronological order. Third, everyone in his roster of artists did a fine job. More on that in a moment, but Baylis' past contributors in particular have made real strides in their storytelling. Lastly, Baylis has finally learned to rein himself in a bit. A huge flaw for many writers who don't draw (especially those that do autobio) is that they tend to over-write their stories. They simply don't know how to let the visuals of the story work as an equal partner. There's also a tendency to ramble on for too many pages instead of distilling an anecdote to its essence, the way that Harvey Pekar did so well. Baylis still has a tendency to overexplain the significance of certain events rather than letting the event speak for itself, but that tendency is lessened when he writes shorter stories. The fact that the stories in this volume were all between two to four pages seems to be a key as to why they were so effective. Much of this issue is an ode to filmmakers that have meaning for Baylis, often in connection to specific life events. "So...Chalk It Up To Konglateral Damage", drawn by Thomas Boatwright, is interesting because Baylis associated the movie with Thanksgiving--and that he never got to see it all the way through. 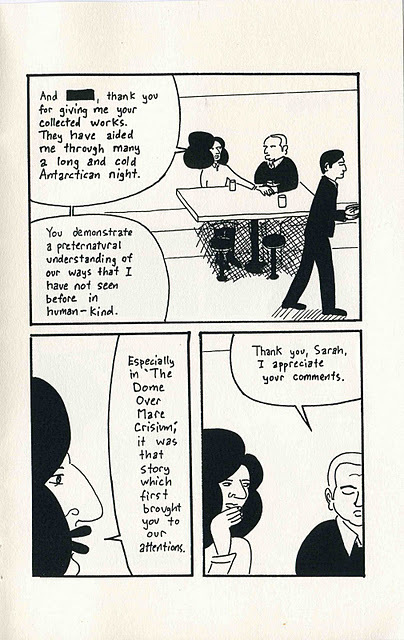 "So...Stranger Than Parrot Eyes" (also drawn by Boatwright) is a more cartoonish story about Baylis seeing director Jim Jarmusch on the street. Baylis fantasizes about hanging out with him and his "Sons of Lee Marvin" friends while ruminating on what appeals to him about film and what turns him off. Noah Van Sciver draws "So...Loyal", a history of his baseball fandom. Van Sciver eschews a literal approach in terms of the imagery he uses to illustrate Baylis' narrative in favor of a more whimsical take. It's an approach I haven't seen before in a Baylis comic, and it works. Fred Hembeck draws a very funny story about Baylis' internship at Marvel Comics and how he was put in a position to correct John Romita, Sr. on a piece of art. That there are so many stories in this issue (eleven plus a bonus page from Van Sciver) gives it a nice weight and denseness; the issue turns out to be greater than the sum of its parts. My World And Welcome To It, by Richard Marcej. Marcej is a toy designer and occasional cartoonist who decided to do a diary comic as a way of getting himself to draw every day. The subject matter is mostly standard diary work: movies he sees, bathroom habits, notable sights and events from his life. He is, however, extremely open about his life in terms of his dating habits and family tragedies, treating them with respect but also with the same level of detail he uses in his other strips. What sets this strip apart from similar work is the fact that each entry is cleverly composed and extremely well drawn. Marcej uses a single large panel frame and varies the strip's internal structure depending on what sort of story he's telling. For things like movie reviews, he splits the page up into four panels, underneath the date and a title for the strip. In the strip above, a single image dominates the entire page. In other strips, he'll lead the reader in three different panels that bleed into each other. Marcej pays special attention to clarity in his storytelling while adding a lot of detail such as hatching, cross-hatching and carefully-rendered structures. Marcej is also a fine letterer, a crucial but overlooked aspect of diary comics--especially for wordy artists like himself. The clarity and simply pleasing quality of his lettering makes even the most text-dominated strips nice to look at. Marcej isn't exactly being innovative with this strip, but it's one of the best examples of this sub-genre. 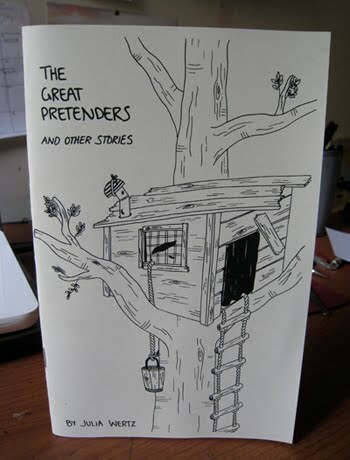 The Great Pretenders And Other Stories, by Julia Wertz. 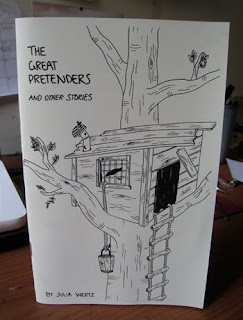 Some of these stories have appeared in past Wertz minicomics, but this mini is the best collection of Wertz's new trend in storytelling until her new book comes out. All of the stories here are from Wertz's childhood and they're entirely unsentimental, raw takes on the ways in which children parse the adult world. There's a reference in the title story to a baby in Wertz's family dying when she was just a child, leading to a game with her older brother wherein he pretended he was his own fictional twin brother. There's a running theme in Wertz's comics of wanting to be someone else, wanting a different life and identity. There's a tension between being a near-solipsist and someone desperately craving meaningful interaction, and that conflict is evident in these childhood strips as well. Wertz has a constant sense of things not being quite right (like the amazing strip where she and her brother are momentarily excited that they might be getting a heat lamp for Christmas instead of a Nintendo video game system), and that feeling is hilariously warped through her own logic as a child. The dread that Wertz felt as a child also emerged in her anxiety over "killing" Jesus in a tea party game and living at the foot of a mountain that supposedly housed vicious flying monkeys. Wertz's bug-eyed drawings are getting more and more self-assured; she's found a clear, distinct and funny drawing style that works well for her. 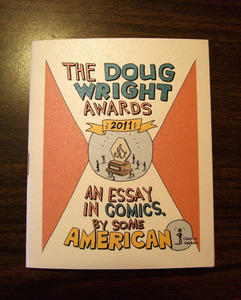 The Doug Wright Awards 2011, by Dustin Harbin. 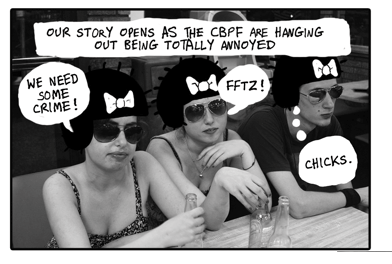 This is a collection of the strips Harbin did at tcj.com earlier in 2011 as part of their Cartoonist's Diary series. It's essentially a love letter to Canada and its Doug Wright Awards, a ceremony honoring the best of English-language Canadian comics. Harbin is impressed by the simplicity (just four awards), sincerity and seriousness of the event. It's an event that everyone involved believes in, a group that includes the greater Canadian cultural community, not just comics. Harbin heaps on the praise a bit exorbitantly, though he's aware that his status as an outsider perhaps blinds him to Canada's flaws. That said, there's no question that Canada has produced some of comics' greatest artists over the past thirty years or so, and so an event like the Doug Wright Awards is certainly warranted. The real appeal of this comic is Harbin's remarkable skill as a caricaturist, really nailing artists like Chester Brown & Seth without belittling them. In an unspeakably heart-rending tragedy, Rosalie Lightning, the young daughter of cartoonists Tom Hart & Leela Corman, died unexpectedly this week. 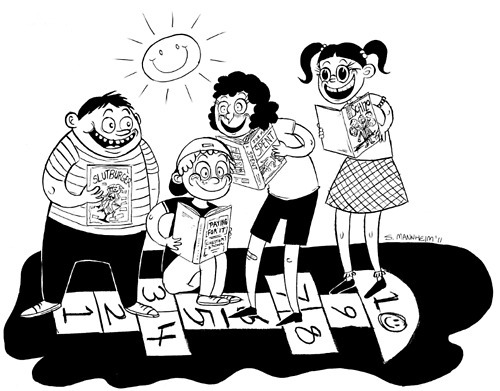 Their friend Lauren Weinstein is setting up a Paypal fund to help defray the awful expenses at this time, as well as possibly establish a scholarship in Rosalie's name at Hart & Corman's new Sequential Artists Workshop (SAW) in Gainesville, FL. Hart found a working space for the school just a few weeks ago and released the first curriculum for the 2012-2013 school year, when SAW will open. Here's the link to Weinstein's Paypal account. Please consider making a donation if you can. I've previously mentioned the Sequential Artists Workshop that Tom Hart & Leela Corman are opening in Gainesville, FL (home of the University of Florida). Recently, the school announced its initial curriculum for the fall of 2012. Hart spent years at the School of Visual Arts in New York and is writing a text on teaching comics; he's a fine writer about and critic of comics as well as being one of the best cartoonists of the Xeric generation that sprang up in the early 1990s. Hart is known for his close relationships with many of his students, and as such he's been selling two broadsheets at conventions that reflect his interest and guiding hand. The first is Seriously Comics, a broadsheet that Hart says was inspired by Peter Bagge's classic I Like Comics fanzine from the 90s. Hart wanted a goofier, more irreverent take on comics than something like The Comics Journal or Comic Art and wanted it in a cheap, disposable format. As such, this broadsheet is a great success. While Hart is all over this publication, his former student Stephanie Mannheim is the engine behind nearly every feature, which functions as the most entertaining school newspaper ever. 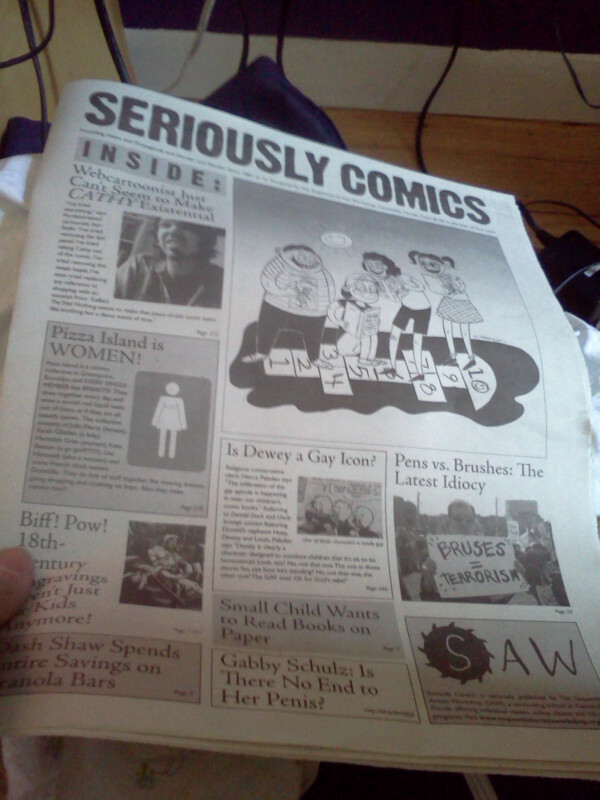 The cover functions like an issue of The Onion, with snippets of "stories" like "Webcartoonist Just Can't Seem to Make Cathy Existential", "Is Dewey A Gay Icon?" and "Pizza Island is WOMEN!" mixing with teasers for actual stories. The combination of Hart's enthusiasm and sincerity with Mannheim's boundless energy and smartass attitude results in a publication that's more than just a lark. Indeed, the interviews with Dash Shaw, Gary Panter and Keith Mayerson (yes, this is a highly SVA-centric publication) are substantive and revealing. That said, it's the ancillary material, the frosting on the cake, that sets this apart from other comics publications. In addition to a page of comics by Aaron Renier, there's a good old-fashioned fumetti strip featuring "Stacey Nightmayer" and various cartoonists, a photo feature on the amusing "Ballpoint Boxers" event (wherein female cartoonists drew on men, a flip of an event from 1950 wherein a bunch of male cartoonists drew on women in bathing suits), and a hilarious feature called "Vote For Your Favorite New York Cartooning Couple". This send-up of tabloid journalism was perhaps a little in-jokey, but most of the people buying this will probably get the references. I hope that Hart & Mannheim can keep this going. 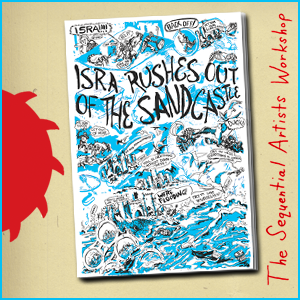 The other broadsheet Hart's been selling is Isra Rushes Out Of The Sandcastle, a collection of one-page comics from various of his students hand-picked by Hart. It's a surprisingly strong anthology given that much of it is student work (with some stories directly adapted from assignments), featuring a number of different visual approaches. There's delicate, image-driven comics as poetry from Alexander Rothman, brush-heavy confessions from Li-Or Zaitzman and a hilarious, scatological manga-inflected comic by Kendra Wells for starters. 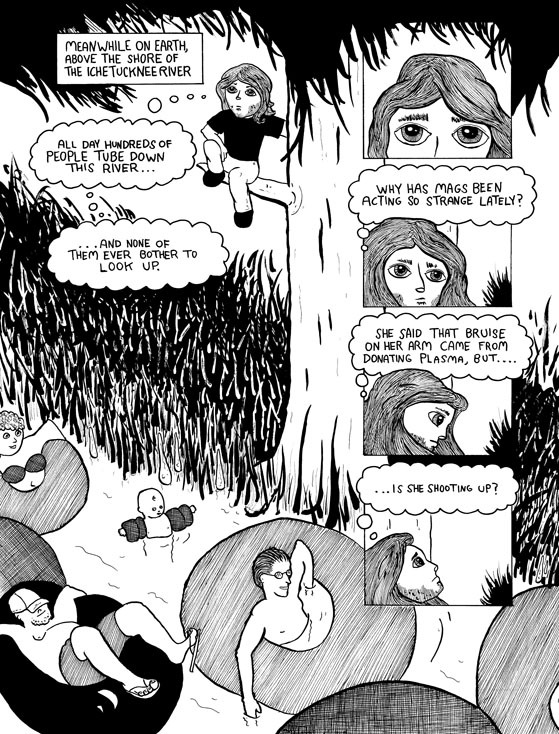 There are excerpts from larger works (like a surreal, expressively-drawn story from Maria Sputnik and a page from a Mannheim comic that frankly doesn't make sense outside its larger context. 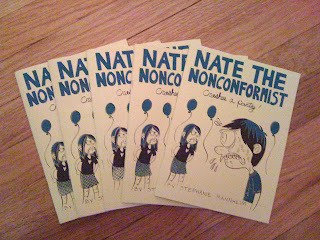 Not everything in here sparkles (Hillary Allison's crack at a daily, gag-driven comic strip features fairly stale observations and Shauna Grant didn't have the chops to pull off her manga-meets-classic-cartooning stylings), but it's all at least solid and some of it is outstanding. In particular, I thought the last three cartoonists featured all had distinctive visual styles. 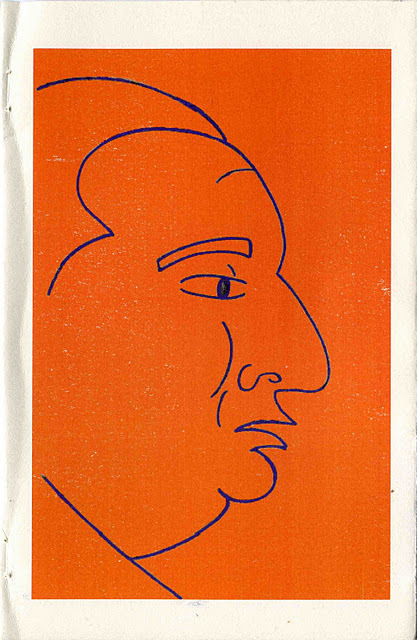 Henry Fernau's kinetic woodcut-style piece had a wonderfully expressive economy of storytelling. Alabaster did a fine job of channeling classic cartooning and balancing it against classic literature. Finally, Katie McEwen's delicate illustration reminds me of the fragile work of Aidan Koch or Amanda Vahamaki. 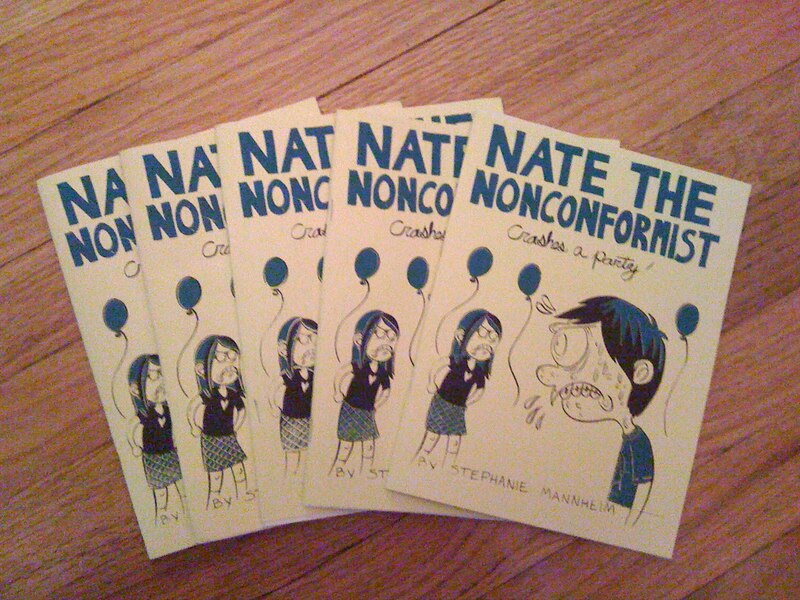 Mannheim's own Nate The Nonconformist Crashes A Party minicomic is over-the-top social satire in the vein of Peter Bagge's Hate! Mannheim employs a similar kind of grotesque, exaggerated figure work to take aim at the sort of self-styled punk "non-conformist" who thinks a t-shirt bought from Hot Topic is a cultural and political statement. The targets are broad and a little easy in this comic, but Mannheim makes up for that with bugged-out eyes, sharpened teeth and some pretty trenchant jokes. (Having songs like "Whip My Hair" and "Black & Yellow" playing at the party was pretty amusing, for example.) Having the titular character crash an intervention because he mistook it for a party was another great gag. Mannheim is more directly parodic than Bagge in terms of her targets (no one in this comic resembles a realistic character), edging more towards Johnny Ryan in terms of the way she sets up gags and how far she's willing to take them. She definitely has her own style, however, and it's fully-formed and distinctive. Emma Capps is kind of an odd case to review. 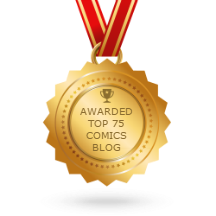 She's precocious and wants the reader to know it, plastering the fact that she's an award-winning 14-year-old cartoonist all over her comics and promotional material. This would be grating if she wasn't otherwise so endearingly enthusiastic about every aspect of comics and art. It must also be said that she sent me the most organized and best-looking press kit I have ever seen from an individual artist. There was a crisply-written letter of introduction, a selection of her hand-made postcards with personal messages, an impressive sheet with pull quotes, a business card and the comics themselves, all collected in a folder that has a Chapel Chronicles sticker on them. I'm not sure if her fastidiousness is a way of letting adults know that she's serious about all of this and wants to do the best job possible or if that's simply her nature. Either way, one couldn't help but be impressed with the packaging and her confidence. The magazine-sized comic she enclosed is a collection of The Chapel Chronicles, Capps' webcomic. Chapel is loosely based on Capps, drawn with big red hair and huge feet. Despite the strip getting off to a rocky start when Chapel introduces herself as "zany" (violating the basic storytelling tenet of "show, don't tell"). Capps quickly wins the reader over with her charming and stripped down character design. These strips don't generally feature gags, per se; instead, they are built around the amusing observations and foibles of its lead character. 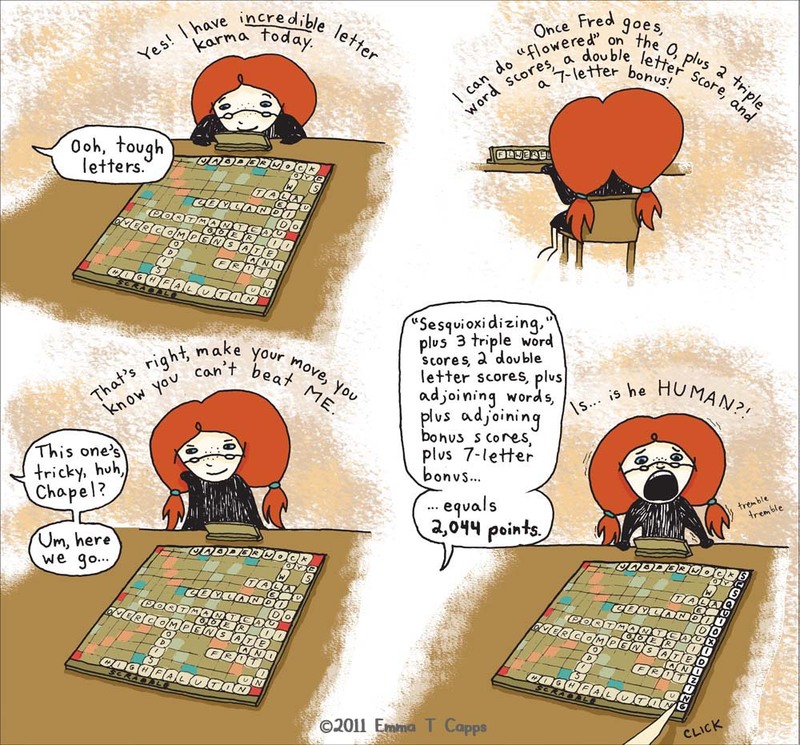 Capps takes us through a night of playing board games with a babysitter, how Chapel does (or doesn't do) her chores, how Chapel becomes obsessed with Lady Gaga, and what happens when Chapel gets a pet hedgehog. It's all lightweight and cute, unburdened by pretension. What makes it worth reading is Capps' obsession with detail: adding eye pops, taking jokes to strange places (like popping into Alice's Adventures In Wonderland at one point) and even her artist's comments below each piece. 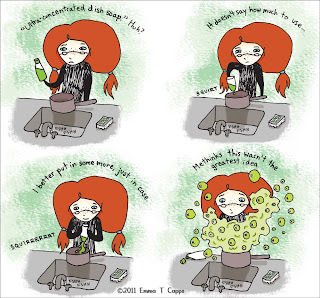 The main problem with this comic is that her use of color is occasionally garish and overwhelming. There are times when she seems determined to have something eye-grabbing in every panel and relies on color splashes instead of the strength of her composition. Her drawings are certainly expressive enough on their own; a splash of color would more than suffice to provide a vivid reading experience. Her more interesting and ambitious comic is Jam Days, an autobio story about Capps' quest to get enough cherry plums to make her own jam. Other than employing a lot of weird perspective, this is a solidly designed and attractive comic that brings life to some quotidian details about a day spent adventuring outside. The comic captures her constantly whirring mind, giving a fairly quiet set of events a surprising amount of momentum. Her use of color is much more restrained in this comic, and the result is a palette that flatters her linework. Capps has pretty good chops at this stage of her career, especially in terms of drawing from life and drawing objects. She's also a solid storyteller. It's obvious that she has a relentless work ethic, which is the only way a young artist can get better in a relatively short period of time. Capps' work at this stage is not unlike Ariel Schrag's first book, Awkward: enthusiastic, episodic and having more to do with being a child than being a young adult. I'll be curious to see how she continues to develop, what kinds of choices she makes as an artist and if her devotion to comics will remain steadfast as she grows older. Let's take a look at a couple of minis from two grads of the Center for Cartoon Studies that have specialized in humor. Bonesteel, by GP Bonesteel. 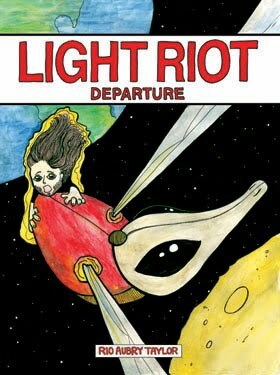 This is a collection of fanciful diary comics from Bonesteel, a cartoonist with a limited range in terms of his line but an expansive imagination. He's a fine storyteller who isn't afraid to push the envelope in many of his comics, but the humor here is surprisingly tame and typically geek-friendly. Bonesteel seems to be going for a highly simplified, cute character design style not unlike a typical syndicated cartoonist. While his own self-caricature is perfectly rendered, he seems to have a lot more trouble drawing women (including his fiance'). The best jokes in the comic are those that aren't so heavily dependent on pop culture references and that push the bounds of good taste (like a hilarious strip about showing his love for mini-wheats cereral by depicting himself masturbating to them). 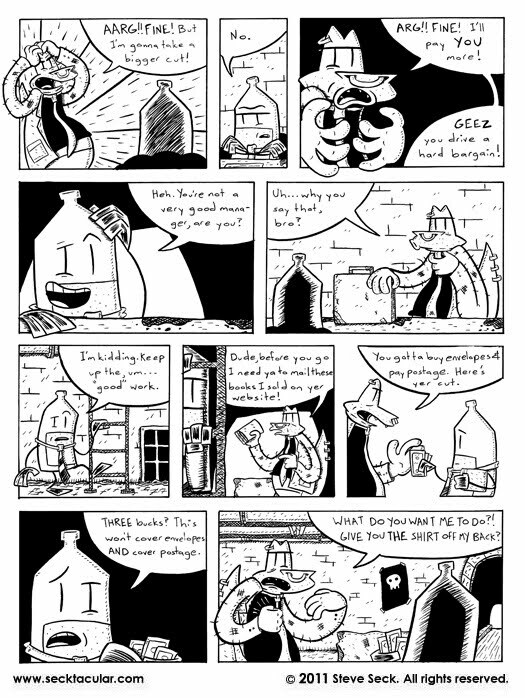 There's the kernel of a good strip here, but Bonesteel needs to work on figuring out a direction that works best, making it different enough from standard webcomics to stand out, and honing the designs of his other characters to make them more interesting to look at. (Fixing the strip's many spelling errors certainly wouldn't hurt.) Like many webcartoonists, this feels like Bonesteel trying to get better in public by working steadily, emphasizing production and discipline above all else. Life Is Good #7, by Steve Seck. Seven issues into this anthropomorphic social satire, Seck has really tightened up his art, focused his narrative and resolved the storyline in a funny and satisfying manner. Seck made the wise decision of giving his funniest characters the most screen time without overusing them, as slimy vegan poser Dr Peace Rock conspires against Charles the Gator and awful crusty-wannabe Sewer Gator annoys lead character Brownie on virtually every page. 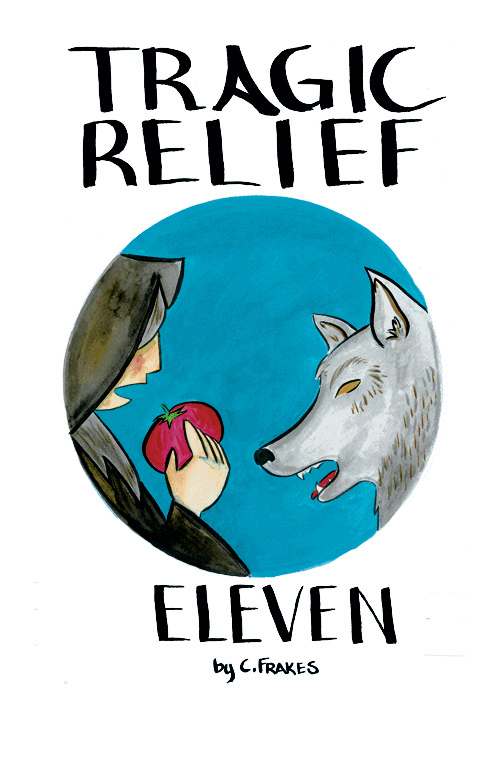 This comic is all about losing one's job, living on the margins of society, dealing with the weird characters one finds on those aforementioned margins, and the hypocrisy that can result by conflating principles with ego. Seck's lettering is still a little hard to read at times (especially when he mixes upper and lower case letters), but there's a much greater clarity to his work now, even on pages when he jams in as many as a dozen panels. I'll be curious to see if there's another storyline featuring these characters or if Seck goes in a completely different direction.